Art and wine have long been associated; both are subjective but rewarding. However, apart from a wine’s colour, the medium for enjoyment is its sensory flavours; gustatory perception: in comparison art is visual. Both are forms of human expression and emotive. Dom Perignon therefore are striving to extend the visual, partnering with world famous artists to represent their great cuvee through art: David Lynch created the 2002 Rosé and the studio of Andy Warhol the Limited Edition 2002 Blanc bottles, which already costs £750 for a six bottle case. 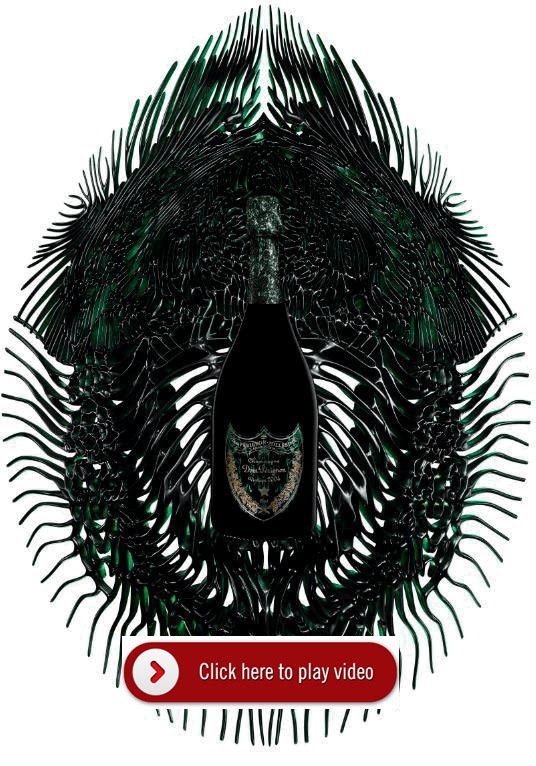 Continuing their Power of Creation project and following the success of last year’s Jeff Koons bottlings, Dom Perignon has announced the latest in their artistic series: a collaboration with Dutch fashion designer Iris van Herpen. van Herpen took the fashion world by storm at the age of 26 with her 2010 collection, showcasing architectural and technological 3-D printing techniques which were as innovative as they were aesthetic. Her amazing work is often described a ‘sculptural’, her designs only realised when interacting with female form, adapting and changing into new shapes. For Dom Perignon, she has breathed life into the estate’s mantra of “metamorphosis” — the continual development in bottle until the beautiful creature inside has matured. Dom Perignon is one of the world’s strongest drinks brands and their Rosé and Blanc together are two of the greatest prestige cuvees in Champagne. Dom Perignon’s savoir-faire in wine-making continues to push boundaries and in 2004 they produced one of their greatest ever vintage Champagnes. Critically acclaimed and hugely sought after in the market, it parallels the epic 1996. The 2003 Rosé represents wonderful wine-making in a very warm year in France, Dom Perignon have pushed the envelope producing an incredibly fragrant Champagne reminiscent of a red Burgundy, with ripe red fruit, notes of strawberries and cream and a voluptuous mouthful. The colour of the Rosé is simply beautiful, a metallic copper, symbolising the raw materials used in art. Antonio Galloni scores the 2004 96 points, placing it within the Pantheon of Dom Perignon legends, a score that means this wine is undervalued in the short-term but with incredible potential for price appreciation. The wine has found immediate favour and availability in the market is low. Great vintages of Champagne have enormous global demand on release, at which stage they are ready to drink and find their way into restaurants, clubs and private cellars. Within a short period their supply becomes insufficient to meet market demand and prices rise. Buying on release provides the singular opportunity to buy the wine before market forces cause price appreciation. The Dom Perignon collaborations are made in small quantities and sell out quickly. They make wonderful additions to any collection. The 2004 Dom Pérignon continues to develop beautifully. A vibrant, focused Champagne, the 2004 clearly reflects the personality of the year. Freshly cut flowers, white peaches and pears are woven together in a Champagne that impresses for its focus and energy. Chiseled saline notes support the crystalline finish. I imagine the 2004 will always remain relatively bright and linear, but at the same time, each time I have tasted it over the last two years the 2004 seems to have a little more body and broader shoulders. The 2004 will appeal most to readers who find the 2002 and 2003 too exuberant. There is a lot to like in the glass.